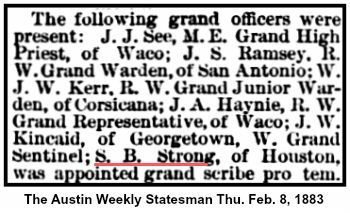 The administration of Grand Master Seth B Strong which began in Dallas February 2 1891 and ended in San Antonio February 1 1892 was considered one of the most successful in the whole history of the Grand Lodge of Texas up to that period of time. 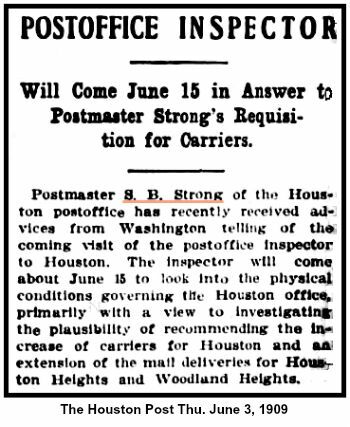 This was certainly true at least so far as an ingathering of members was concerned since the reports show a net gain over 1890 of 1551 members which brought the total membership up to 6974 for the term ending December 31 1891. The friends and advocates of the reduction of charges as adopted in 1891 were jubilant over the results there from This remarkable increase in membership did not result from the institution of new lodges to any great extent but rather resulted from the fact that a great number of applicants had been admitted to lodges already established. 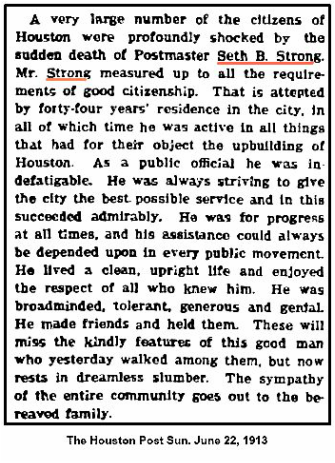 This conclusion is certainly true since it appears that Grand Master Strong had not issued dispensations for but few new lodges which are here given as follows: Lily No 342 at Aransas, Pass Nocona No 343 Red River, No 344 Gainesville, Corn Hill No 345, and HK Judd No 346 at Vienna. In fact the last mentioned lodge was very largely a reorganization of the defunct HK Judd Lodge No 122 which was established at Speaksville in or about the year 1871. 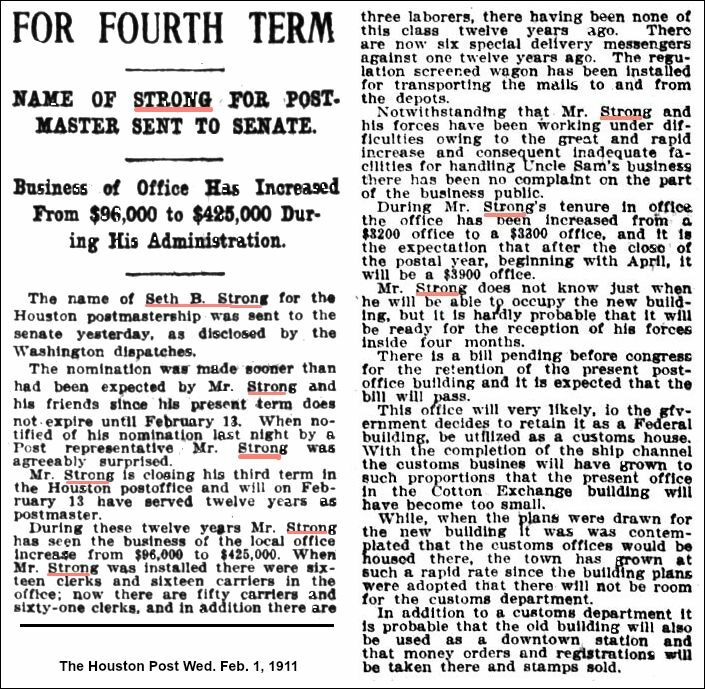 From this statement it can be readily seen that the progress made in Texas Odd Fellowship in 1891 was largely due to the admissions and reinstatements into old lodges rather than to the admissions into lodges organized during the year. A few defunct lodges however had been resuscitated, a list of which is here given Washington No 17 at Rusk, Bois d Arc No 36 at Clarksville, Nolan No 277 at Sweetwater, and Granbury No 237 at Granbury. 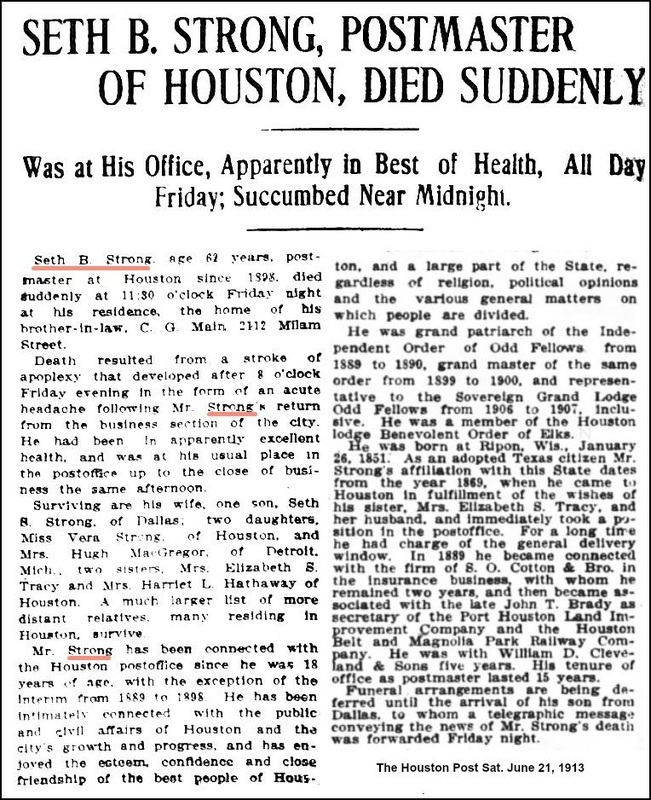 Seth Bates Strong died In Houston, Texas on June 20th, 1913. 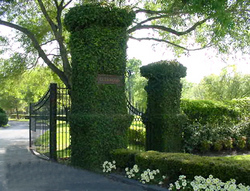 He was buried at Glenwood Cemetery in Houston. The grave is unmarked however there is a record of the exact plot location.